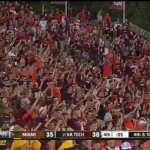 An incredible scene unfolded at Lane Stadium on Saturday during the final seconds of Virginia Tech’s 38-35 victory over Miami, as the fans worked themselves up into a frenzy when Metallica’s “Enter Sandman” began to play on the stadium speakers during a Hurricanes timeout with five seconds remaining, and once again when the final whistle blew moments later. Although Lane Stadium somehow didn’t make our list of the “13 Best Places to Watch College Football,” this video suddenly has me thinking that it not only should have made that list, but it could have easily been number one. 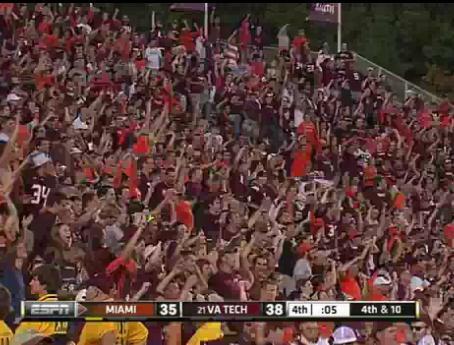 Here is a look at the wild scene inside Lane Stadium on Saturday.